Could I be happier? 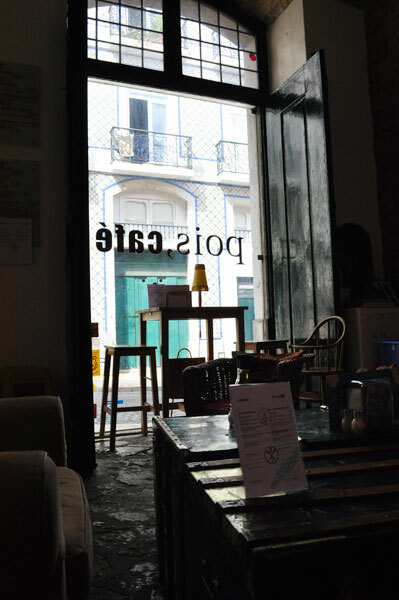 Sitting on a 25 degree day in pois, café in Alfama. The picturesque pinnacle of the enchanting city of Lisbon, Portugal. My mind is turning to questions of cost of living, average rental payments and could we really live here? But of course it is just a holiday dream. It’s been an eon since I last strolled into a cafe and felt so at home. The couches surround a large buckled chest and rows of books on shelves to the left and the right. The menu looks appealing – too bad we have just eaten. So I order a double espresso and Julia requests a soy latte. And they have soy! Are we in coffee paradise? Leider nicht (unfortunately not). Julia’s latte is obviously a latte machiatto (coffee poured in after the milk) and just doesn’t quite cut it. 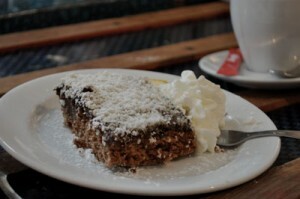 But my double espresso is adequate – it does the job together with a coconut chocolate cake that reminds me of the one and only Aussie speciality, the lamington. I may not be in coffee paradise, but I am in cafe bliss! Come for the ambience, the German book and magazine selection and enjoy Alfama!